Reports from Barbizon on new and interesting lighting and production equipment for content acquisition and at the National Association of Broadcasters Show held April 9-12, 2018 in Las Vegas, Nevada. Wenger Corp showed their new Lieto™ LED light fixture specifically designed for use in full-stage acoustical shells. With a 12,000-lumen output, the Lieto fixture design utilizes lightweight aluminum and a “snag-free” curved ABS design for acoustical shell integration. The exceptionally shallow mechanical design fully encloses components and precludes interaction with people or nearby stage equipment to enhance safety. The fixture includes a powder-coat steel bezel that complements the aesthetics of your acoustical shell. Lieto is now available for order with Diva® and Maestro® shells. While not at NAB we wanted to include our friends at DSC labs. Last year after NAB they made a change to their printing substrate moving to the use of new AcuFlect 3 media. AcuFlect 3 while less reflective than the original AcuFlect Glossy, still maintains the dynamic range and color saturation that have made the original charts legendary. Why did they do this? After testing of a variety of different materials, customers reported back that setting up the charts was much easier under multiple different light sources, saving time and making the camera reference process go faster. As a bonus, the new AcuFlect 3 surface can be wiped down with a damp cloth and has the added benefit of being more Eco-friendly. Backstage has added thirteen new carts to their extensive line of production and cinema carts. Some of these are modifications to their existing carts while some are able to be customized through options available. In addition to the Skypanel 120 Cart (E-17), the Skypanel 60 Cart (E-18 Mini) and the Skypanel 360 Cart (E-19) are now available. These carts feature all-steel construction and house the Skypanel fixtures, cables and power supplies. 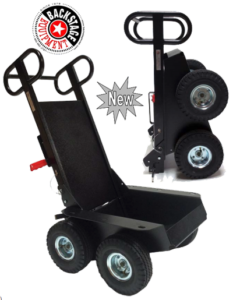 The Cable Cart(GE-02) and the Cable/Sand Bag Mini Cart (GE-02 Mini) both now have a foldable version available. The Backstage Head Cart(E-02) and the Apple Box Cart(G-10) both now feature Plus versions with increased size and capacity, the Apple Cart Plus(G-28) and the Head Cart Plus (E-02 Plus). The C-Stand Mini Cart Modular (GE-19 Mini) has so many of options. It holds up to 13 C-Stands or 8 Combo Stands or11 Baby Stands or configure it according to your needs. 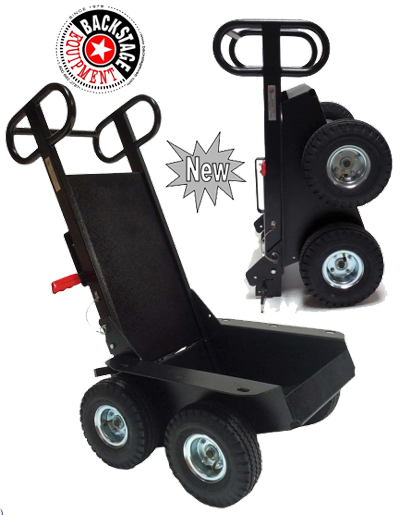 Tires also have options, Foam Filled or Pneumatic tires, this cart can be modified to be whatever you need it to be. 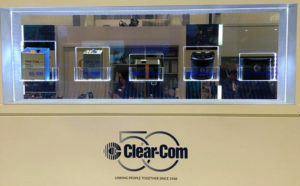 High End Systems, recently acquired by ETC, had some their LED-powered fixtures on display within the Electronic Theatre Controls booth at NAB. First of note as silence is golden, the SolaFrame Theatre is the industry’s first automated LED luminaire to deliver completely silent operation. Lightweight and compact, the SolaSpot Pro 1000 offers high intensity and a full feature set for complete creative freedom. 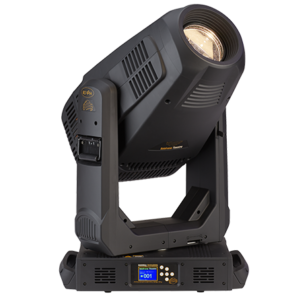 A 440-watt Bright White LED engine and specially designed optics allow the SolaSpot 1000 to boldly shine through the crowd, while the cutting edge rotating Animation wheel, fixed gobo and color wheels, CMY/CTO system, iris, frost, prism, and zoom create a cornucopia of lighting effects. Robe Lighting had a large range of their fixtures at NAB this year for broadcasters who not only need lighting for on-air personalities but for also ambient set and air effects interest. For fixed fixtures, Robe’s ParFect line in its various flavors are a popular fixture because of their incredibly wide zoom range of 3.8°– 60°. 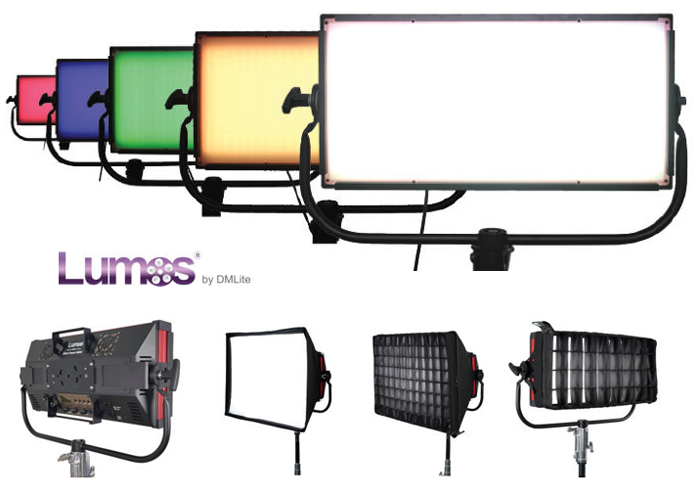 Their PATT range of fixtures have become a must-have for visual interest on sets and tours worldwide. Moving head fixtures have always been Robe’s forte, and Robe’s DL7S Profile is the first DL range fixture to receive a powerful new 800W version of the LED engine with seven colors for unprecedented smooth, stable and even color mixing and a very high CRI. The Spiider and Tarrantula fixtures are superbright next generation of LED WashBeam luminaires. Spiider uses 18x 30 Watt and 1x 60 Watt LEDs and combining it with a very efficient 12.5:1 zoom optical system ranging from tight 4° Beam to wide 50° while the Tarrantula is powered by 36x 30W and 1x 60W high powered emitters providing a stunning 20,000 lumen output. The versatile optical system offers an adjustable beam angle, from a tight 4° spot to a super-wide 50° wash, of the highest quality light. Celebrating 50 years of providing communication to all kinds of productions Clear Com had some neat new items at NAB this year. 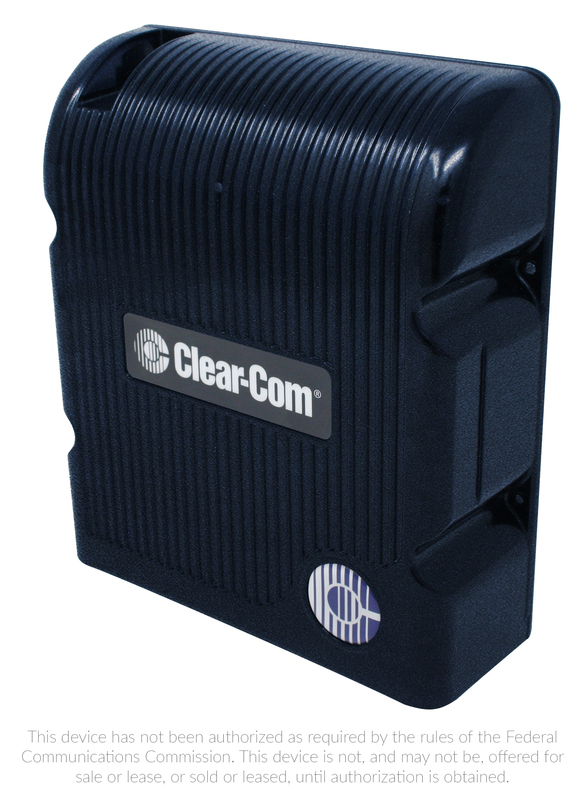 The all-new FreeSpeak II IP Transceiver (IPT) based on Clear-Com’s new IP Platform solution allows FreeSpeak II wireless beltpacks to be addressed across a user’s LAN. Additional enhancements support a higher density of users per transceiver as well. Existing FreeSpeak II beltpacks may be upgraded to work with the IPT through a simple firmware update. Transceivers are connected to an AES67 IP-router and to the Eclipse HX system fitted with Clear-Com’s E-IPA high density audio-and-intercom-over IP system card. Each E-IPA card—also native AES67 based– provides up to 64 ports of IP connections which effectively supports 64 IPTs. The IPT Transceiver can be powered from a PoE switch or local power source. Direct fiber connection is also available on each IPT. Fluotech released their additions to the Vegalux motorized zoom fresnel line at NAB introducing the 200HP and 200UHP versions with 60 and 80% more light output than the original version. 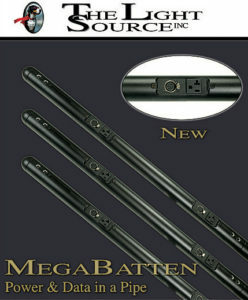 The entire line is available in both tungsten and daylight color temperatures. Not to be overlooked, the affordable Auralux 100 is a manual version of their LED Fresnel providing good light output for those who are looking for value or do not require motorized zooms. 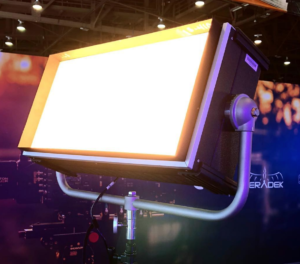 Also on display were the Cinelight Studio is Fluotech’s entry into the long throw soft LED panels on the market and of note, the new Starmaker weatherproof IP rated, bi-color panel. Lumos continues to expand its LED lighting fixture line with both variable color and fully RGBW color changing capability. The Lumos Glow Panel 200C (1k tungsten Output)and 400C (2.5k tungsten output) is ideal for location, commercial and entertainment. Featuring a full range of white color temperature 2800k to 10,000k, all metal body, hybrid cooling system, flicker-free, stable dimming, standard DMX512/RDM, onboard useful 10 presets on a simple interface. For those of you that looking for a white light only panel fixture, check out the brand new line of Lumos 200GT (30w), 300GT (50w), 500GT (120w) and 700GT (200w). The “F” series is available if fixed color 3200k or 5600k. The “MK” series is available in two separate adjustable color temperatures including 3200k-5600k or 2800k-6500k. All available with 40, 55, or 85-degree lenses. Ask your local Barbizon office about the battery mount (12-24v) and snap bag accessories. 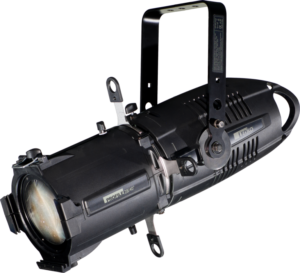 All fixtures feature a 95+ CRI and come with a 2-year manufacturer’s warranty. 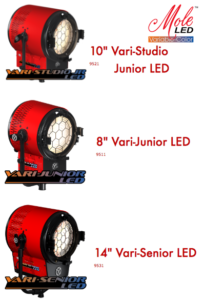 Last year Mole Richardson debuted is new Mole LED Variable-Color Fresnel with the 6” Vari-Baby LED (250w). 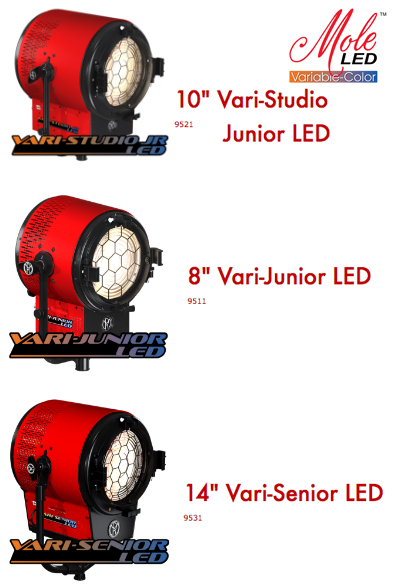 This year Mole Richardson expanded the line by adding the 8” Vari-Jr LED (350w), 10” Vari-Studio Junior (480w), the 14” Vari-Senior (900w) all the way up to the 20” to replace your 10k tungsten. With a color temperature range of 2700k to 5600k, this Variable-Color series of fixtures features an onboard RGB color mixing display with the optics you come to expect from a Mole Richardson lighting fixtures. All fixtures come with Lumen Radio and Bluetooth wireless control capability. The standby draw is <.2 Amps Max. 30V DC making a 30v DC, Block Battery the perfect accessory for location shooting. The Variable-Color series is also available in panels, soft lights, and space lights. 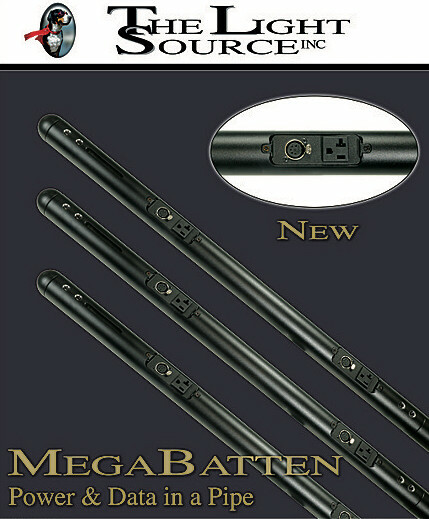 Coming soon is the 10” 5k tungsten replacement and the 17” 10k replacement. Be on the lookout for the Mole Bluetooth app also coming soon. Cinestar is the newest addition to the Airstar family. It has been designed with versatility in mind. Cinestar is fully dimmable, with easy to use bicolor temperature controls. It features a low-profile body and is completely portable, making it the perfect lighting choice for studio, stage, and set applications. Cinestar allows for fast set up (just 15 minutes), and even though it’s 5′ wide when inflated it is easily transportable because it compacts down into a small case and weighs around 26 pounds. 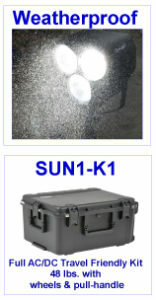 While other Airstar units like the Crystal have been used for area, event and sometimes on sets the Cinestar is the first content creation dedicated lighting balloon that uses Airstars flicker-free “Dynamic White” LED technology with a bi-color LED array with 2700K to 6500K with a high CRI of 96 that uses 850 watts. Sachtler’s new tripod travels fast, from deadlines to wedding lines. Flowtech 75 is a versatile, lightweight tripod that is easier and faster to deploy and adjust than just about any other tripod. It has a 75mm ball, two-stage carbon fiber legs with quick release brakes, a mid-level spreader, rubber feet and a capacity of 44 lb. and is only 10.4 lbs. The quick release brakes allow the legs to be deployed simultaneously and can quickly adjust to the height that you need. The hinge locks allow the Flowtech 75 to be deployed as high as 5 ft. and low as 10″ when used without a spreader. It’s specifically designed to allow the tripod to comfortably rest on the camera operator’s shoulder when collapsed. The Flowtech 75 is branded as Sachtler and Vinten and works with heads and accessories of each product family. Today’s cine and video equipment have spread the range of voltage and power needs like never before. And the loads for high powered LED’s and HMI’s have had no battery solutions until now. Block Battery products provide battery solutions for an ever-evolving portable world. The 2F1 Battery, which can change voltages or mounting options and comes in either the Nickel Metal Hydride or Lithium Ion and is the most versatile battery available. From a V-Lock, to a three-stud camera battery to a 28v power source for an LED light, any power needs under 200 watts, regardless of the output voltage. The SLi-600, 14 and 28 VDC Dual or Switchable Block, is a 550 Watt-hour block designed cinematic camera applications. The compact SLi-600 weighs in at only 16 lbs. and is available in a series “D” or “S,” to be compatible with your power needs. Charge time is 4 hours with 1500 to 2000 recharge cycles. The SLi-600 uses the “safe lithium chemistry” of Lithium Iron Phosphate (LiFeP04). It has a modular design which allows the 10 battery blocks to be easily removed and replaced, making transporting the SLi-600 much safer and easier. Replacement cells and be replaced easily as well making service much simpler. Each SLi Series block contains an active balancing circuit that will monitor and balance the individual cells with every charge cycle. 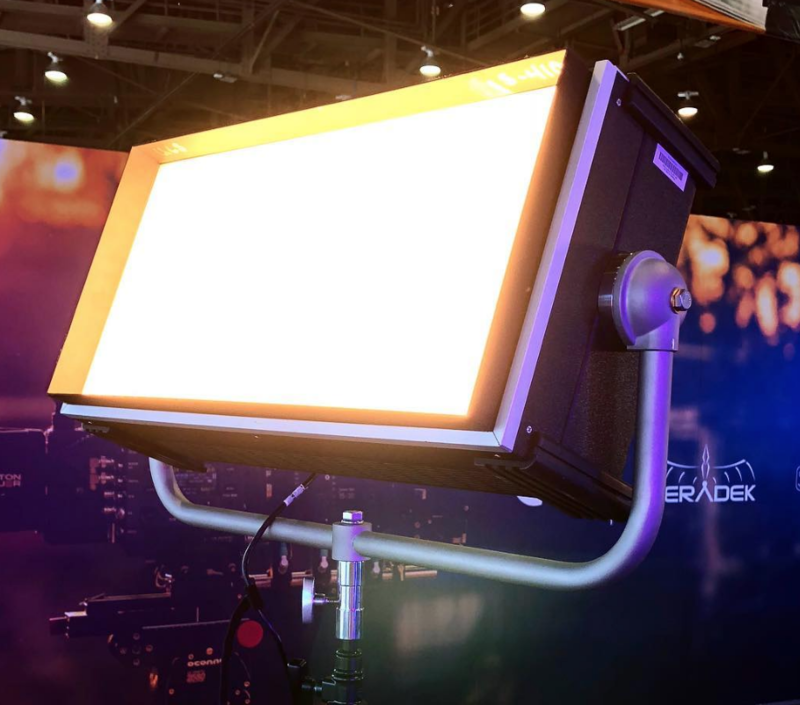 Dedolight brought their range of studio and field LED fixtures to NAB this year. Their focusing fixtures include the stand or camera mounted Turbo series in tungsten, daylight or bicolor, the DLED2, and the DLED4. If you need LED panel lights, they have the Felloni panel and the DLEDRama in different sizes and configurations. The larger fixtures are DMX controlled and are at home in the studio or in the field. Most of their fixtures are available in multi-head kits with all the accessories you could possibly need. Creating a buzz at the show was Litegear’s LiteBox, the perfect accessory for your new LiteTile+ Plus. 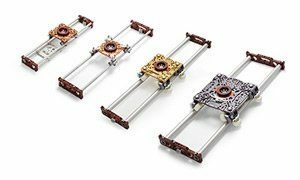 This modular system is designed so that you can mount your LiteTile to a lightweight rigid frame and then have the option of diffusing the LEDs at 1 inch (2.5 cm) or 6 inches (15 cm) away. LiteBox comes with the same three, familiar diffusers as LiteMat — so you can always integrate them together — and opaque fabric sides to eliminate spill light when used in the 6-inch deep version. For rigging, LiteBox is surrounded by 1/4”-20 PEM® nuts and comes with an optional 5/8” baby pin adapter or grip head mounts. 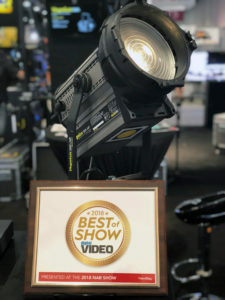 Litegear also brought several pieces of gear to NAB this year that won’t be released until this summer, but brought a lot of interest to their booth. The LiteMat Plus 8 is the largest and newest iteration of the popular LiteMat line. It’s a 4’ x 4’ bi-color LED light source that only draws 400 watts. It can be powered by battery or AC and is controllable via DMX. 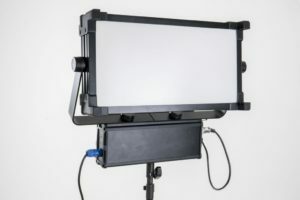 It has front mount accessories available, like the Snapgrid, and it can be hung or velcroed to a wall, or mounted on a stand using its center ball mount. They are also making an LED retrofit for the KinoFlo Image 80, 85, 87, and Flathead fluorescent fixtures. Using the existing frame and yoke, the light engine installs over the existing reflector using 4 screws. Also included is a new power supply/controller where you can choose tungsten, daylight, visual effects green or visual effects blue. Perfect as a large soft source or chromakey light. The LiteMat Spectrum brings camera compliant RGBW to the game to the LiteMat line. Color balancing available from 2000k to 11,000K. It has full spectrum color available, and color can be desaturated using the white light that you have color balanced to. The controller allows you to select the type of camera you are shooting with to ensure compliance. It also is controllable with onboard wireless DMX. With some of the industry’s most compact and highest energy density batteries, PAG is a leader in portable power systems. PAG offers both Gold-mount and V-mount Li-Ion batteries that are stackable for increased runtime through higher Watt-hours. On-board battery controls indicate capacity, load, and remaining runtime for the total of all batteries which are linked together. When stacking batteries, current is not transferred from one battery to another but instead is passed through a central bus bar. This allows batteries to be hot swapped, or additional batteries to be simply added to the back of the stack. Additionally, the PL16+ four position charger allows you to stack and fast charge up to 16 batteries at a time in a compact form factor. Using the internal Intelligent Parallel Charging software, the most discharged batteries will be given priority until all batteries reach a similar level of charge. 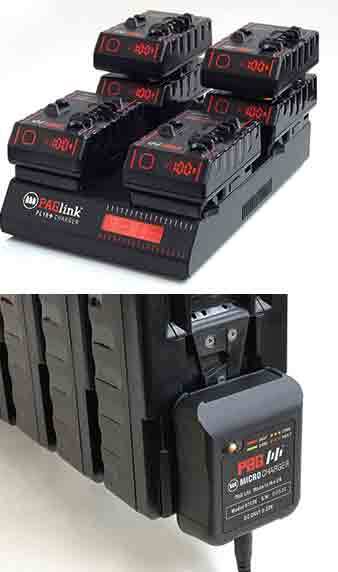 In the field, the PAGlink Micro Charger is the ideal solution for up to four stacked batteries in a travel size charger. Available in both V-mount and Gold Mount, the Micro charger can replenish your batteries from either AC input or DC supply such as a vehicle battery or USB charger. 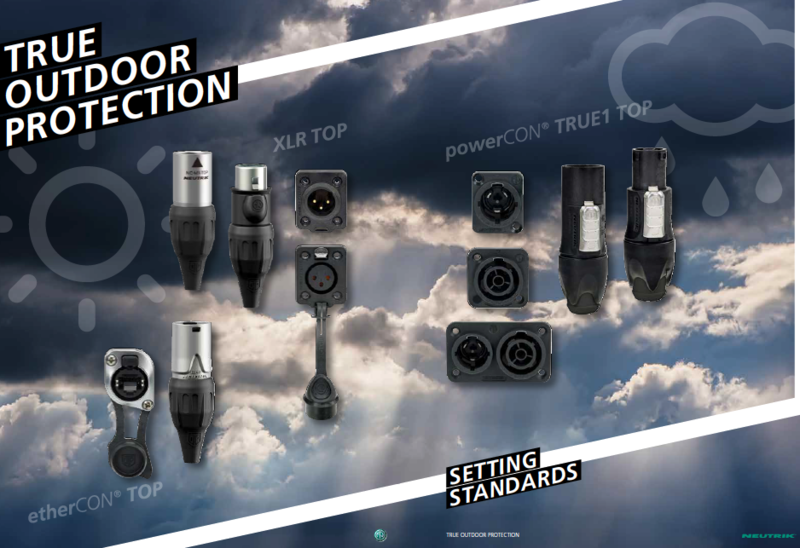 Neutrik will soon be releasing a new line of the popular powerCon, etherCon, and XLR series of connectors. The True Outdoor Protection line gives both IP65 protection and UV resistance through newly styled ruggedized sealed connectors. Neutrik has gone above and beyond by engineering them to be compliant to the IEC 61076-2-103, IEC 60320, UL 1977, UL 498, and UL50E standards. Designed for harsh environments, this system of inlet and outlet connectors will be ideal for outdoor applications such as outdoor PA systems, LED Screens, and lighting systems. 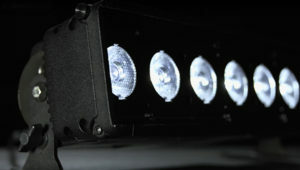 This year Brightline has announced that they are adding Lumen Radio wireless DMX to all of their SeriesONE LED fixtures. They are also developing a wireless interface box to control the original SeriesONE fluorescent fixtures. Integrating this wireless control will enable the SeriesONE line to easily be controlled from any LumenRadio transmitter or controller, allowing for quick setups and less cable. Featured this year was the CreamSource Micro. The Creamsource Micro is less than half the size of the Creamsource Mini+, at just 8.66” x 8.7” x 3.94” (W x H x D), and weighing in at approximately 5.5 lbs. It features a rugged and waterproof design, with an IP65 rating which means it can be used in all weather. Light output is the same excellent quality as the rest of the Creamsource range, with color temperature adjustable from 2700 to 6500K and a CRI/TLCI of greater than 90. 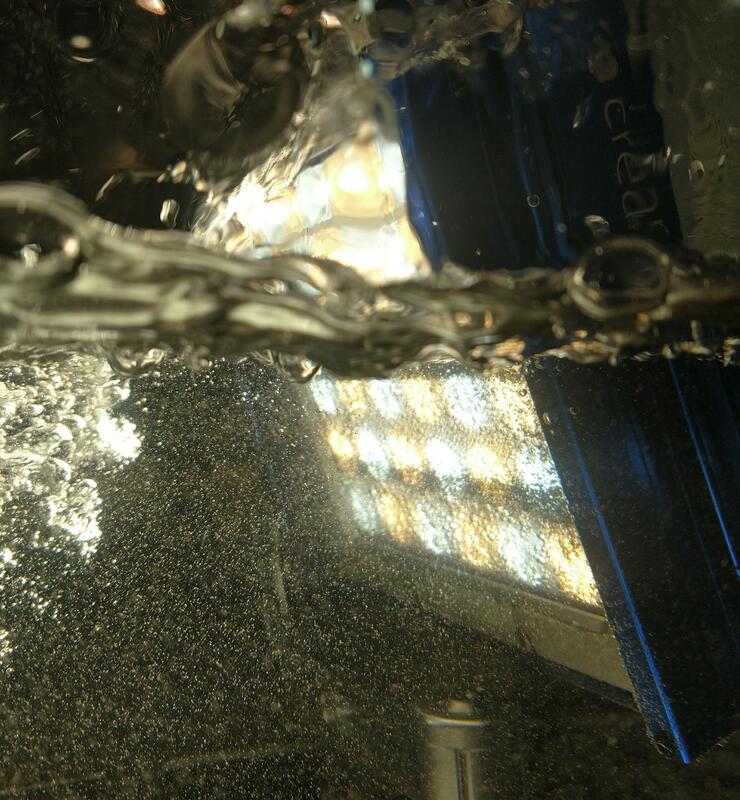 Drawing only 80W, it rivals the light output and punch typical of some 200W HMI Luminaires. Unlike most bi-color fixtures, the Micro maintains constant power output across the whole CCT range, so users always get the unit’s full potential, and there is no reason to have to choose between a bi-color or daylight system. Another key innovation of the Micro is its wide 10-32V operating voltage, allowing users to power the fixture from a single 90WH battery, or directly from a car. Shown here surviving the toughest conditions. We’re Back from NAB and our employee correspondents have scoured the #NABShow floor for the latest and greatest in lighting, grip, studio, and field content creation gear out there. It’s been digested down, images and video have been tracked down and it’s ready. 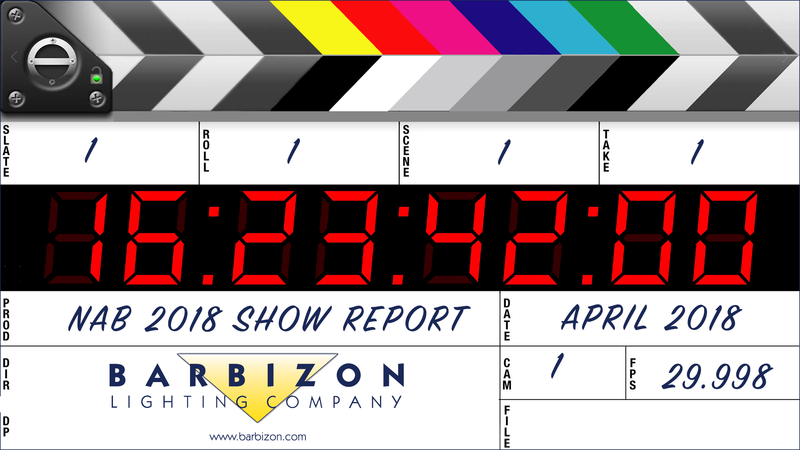 If you see something that’s not quite right or needs tweaks or we just forgot something contact us at help (at) barbizon.com. 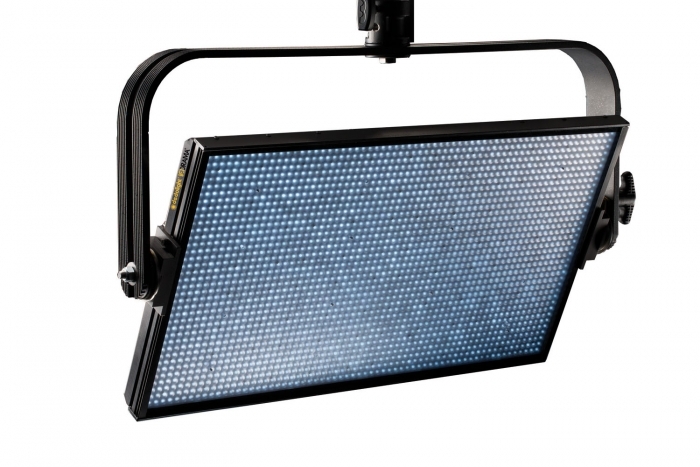 Litepanels launched a new 2’ x 1’ softlight this year called Gemini. 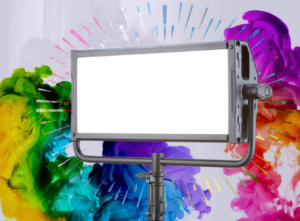 The Litepanels Gemini 2×1 LED soft panel provides a beautiful and wide source of soft, color accurate, full spectrum Daylight and Tungsten lighting. Gemini allows users quick and easy precision adjustment of light with three fully featured lighting modes; CCT Mode for true daylight and tungsten with +/- green fine-tuning, HSI Mode for total control over hue, saturation and intensity to create any color in the 360 color wheel at any intensity from 0-100% and Gel Mode to easily replicate the industry’s most popular gel sets with a daylight or tungsten source. The Gemini is truly versatile with its intuitive onboard controls and remote control options via standard DMX 512 protocol, wireless DMX or Bluetooth and can adapt to any lighting situation today’s Cinematographers and lighting professionals will find themselves in. The manual control knobs are sensitive to the speed of rotation and can either be finely tuned or when ramped up can adjust very quickly. 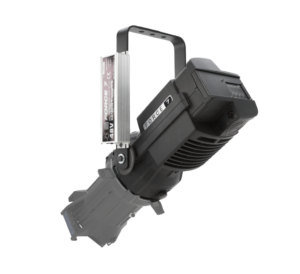 Together with its lightweight design with built-in power supply, and full intensity mobile power operation, via 3pin XLR, the Gemini offers rapid rigging with fewer cables making it the perfect location light. The Arri Booth was a buzz this year following the success of the Sky Panel products. At the core of the Sky Panel’s success is the Firmware, which offers a variety of features that can be used by professional’s every sector of the entertainment market. New for this year Firmware version 4.0 extends the capabilities. SkyPanel Firmware updates are all about adding versatility and control – harnessing the awesome power of the SkyPanel and putting that potential into the hands of the gaffer, lighting designer, or programmer. SkyPanel Firmware 4 takes this ability to new heights. Packed with ten new features, SkyPanel Firmware 4 expands the capabilities of the SkyPanel like never before and offers refined levels of control. Every SkyPanel is made up of one or more light engines. The S60 has two light engines while the S360 has twelve light engines. 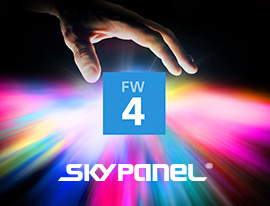 SkyPanel Firmware 4 allows the user to control individual light engines via new DMX modes. 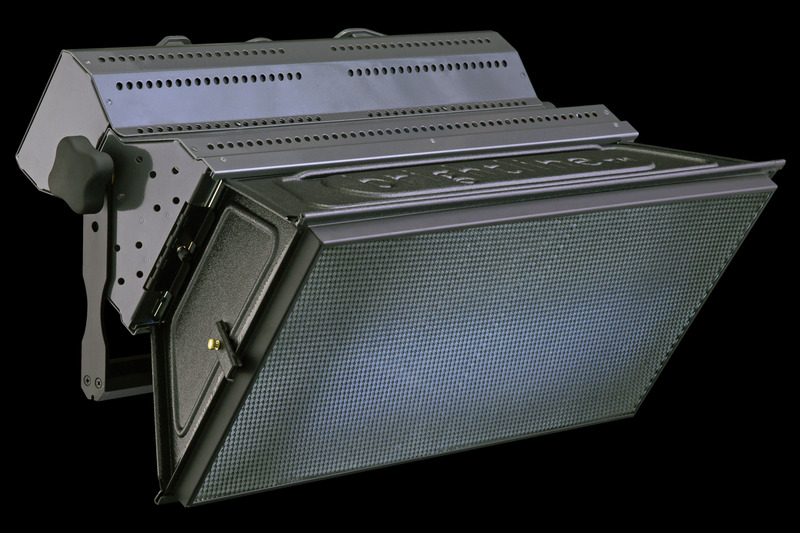 Each light engine acts as its own mini SkyPanel with parameters like CCT & RGBW, HSI, or x,y Coordinates. This precise level of control enables new programming possibilities with the SkyPanel. Arri has also added new effects and enhanced the existing effects. The patent-pending EMBRACE Microphones are buildable and customizable mic’ing solutions new to the audio industry. The EMBRACE microphones are engineered for concealing, but its mounting system keeps the mic placement consistent with the mouth as with traditional headset style mics. This innovation in custom mic’ing is the best of lightweight and low-profile lavs combined with the consistent placement of ear-mounted microphones. EMBRACE ear mount microphones are offered with omnidirectional pickup patterns in single or dual redundancy. The redundant option pairs two matched elements to give peace of mind to tech crews needing backup assurance in live broadcasting and production environments. The new Q-LED Rainbow Linear LED Lamp featuring RGBX was on full display at LDI. This new item from Quasar can run from our 2000° Candlelight to 6000° Daylight Kelvin and can be controlled in a variety of ways, including an onboard control panel, wireless Lumen Radio CRMX or DMX I/O. They can also be daisy-chained together and run in a lead-follow mode. The color options run from a powerful white crossfade to full an RGB mode featuring a full 360° palette for vibrant fully saturated color or mixed with X-fade white light for soft beautiful pastels. Includes color presets for Blue, Cyan, Green, Yellow, Orange, Red, Magenta, Purple. Each lamp is self-ballasted and can run on AC power. The RGB-X Rainbow Lamps use 100-265VAC (World Power) via a True1 connector. There is also a battery option, allowing them to run on off a 10-26 VDC via locking barrel connector. 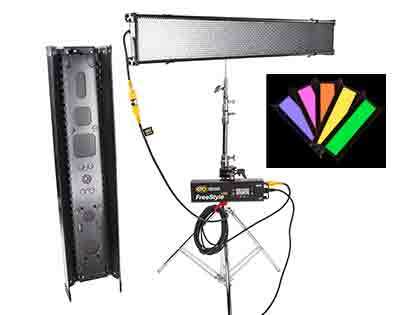 The RGBX come is a two-foot 25 watt, four foot 50 watt, or eight-foot 100-watt form factor. VELVET LIGHT is a high-power LED lighting technology developer and manufacturer of professional high output LED fixtures specially designed for the broadcasting industry. With manufacturing in Barcelona, Spain since 2008, they offer the Velvet Light line. New to the Velvet line of waterproof fixtures is the EVO 2 Color. 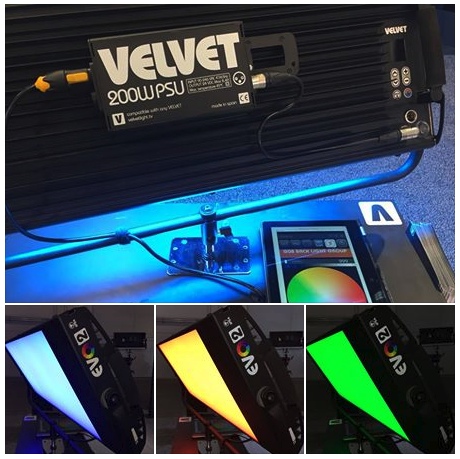 EVO full-color spectrum is an exclusive technology developed by VELVET Light for the film industry. The combination of 5 LEDs, (red, green, blue, warm white, cool white) extends the color possibilities over traditional RGBW technology, producing more natural white light and richer colors. 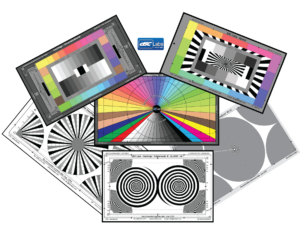 Color filters can also be applied over any color temperatures with more output. The ultra-white inner reflector focuses the light from each LED onto the front diffuser resulting in a super soft uniform natural light at any color or white light setting. EVO’s ergonomic design makes it easy to work with. The two large, soft padded side handles make it easy to grab, even with gloves on. It has a robust 100% aluminum body and offers a weatherproof IP54 rating. 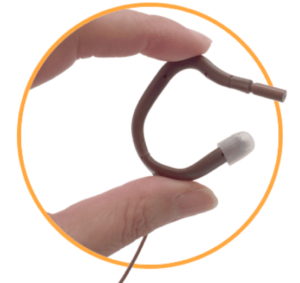 The STUDIO versions offer an IP51 dustproof rating. The onboard control with color display and shock resistant buttons is easy to navigate. Control is also available through the Color Master APP, allowing quick and easy wireless control from your smartphone. The EVO 2 Color is currently in Beta and is expected to be available by September 2018. Erector Sets, Inc. is a full-service design and fabrication company firm specializing in scenery and set construction. 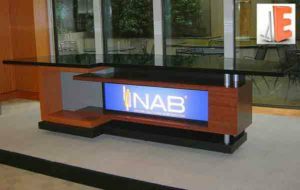 Based in Philadelphia, PA, their staff of woodworkers, metalworkers, and design professionals offer scenic solutions for trade shows, television, and film. Erector Sets’ extensive portfolio includes work with national network affiliates, cable networks, national sports teams, educational institutions and many others. Chimera Lighting in partnership with LiteGear is excited to launch its newest product; the Panel Lantern, Powered by LiteGear. 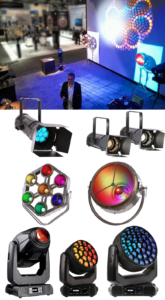 The LiteGear LED engine will feature 95+ CRI and TLCI ratings and the ability to achieve color temperatures anywhere from 2600 to 6000 degrees Kelvin. The panel lantern will be available in a kit which will include the LED head unit, a 24×24” collapsible Chimera Panel Frame, Lantern Fabric, dimmer, 12ft. head power cable and power supply. The entire kit fits conveniently in a ballistic bag and tips the scale at a TSA friendly 6lbs. 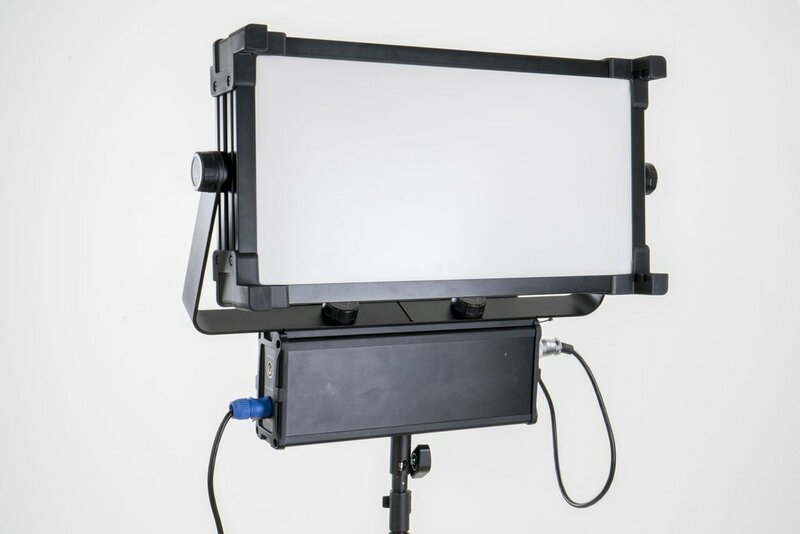 The panel can be mounted any number of ways using a specially designed Matthews/Chimera Grip Head or panel clamp kits for use on a lighting stand or boom. It’s versatility and compact size make it perfect for both studio and on location shoots. Chimera fully expects to be able to ship Panels around June of this year. Chimera also makes durable, rugged, diffusers and softbanks designed and sized for most all the lighting fixtures on the market today. Extreme use, rough conditions, and heavy payloads have been the hallmark of the Avenger brand since its inception. 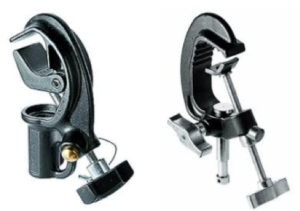 The Quick Action Jr and Baby Clamp fit right in with the needs of today’s professional riggers whether it’s in a theatrical or video setting. No more struggling to mount or dismount heavy or awkward fixtures to your grid or truss systems. Avengers quick release button will allow you the freedom to release the jaw of the clamp instantly from the pipe without having to twist the knuckle. Quick action clamps are available with Jr. receivers for your heavier fixtures as well as standard baby pins for some of those smaller lights in your kit. The Junior clamp can support a max payload of 220lbs and its baby counterpart can sustain weights of up 110lbs respectively. Tiffen– Steadicam, a division of the Tiffen Company have teamed up with Master Cinematographers to introduce the Steadicam Air. The Steadicam Air is a carbon fiber lightweight monopod. The most remarkable feature lies in its spring activated gas lift system. Through the use of a rubberized foot pedal, the operator is able to raise the camera up to 62.5 inches hands-free. The Air comes complete with deluxe carry bag and ergonomic shoulder strap and weighing in at only 3.5lbs makes it a perfect accessory for the videographer/photographer on the go. Brooklyn-based MYT Works highlighted the versatility of their camera support systems, both for static and motion positions. On display were their full range of nodal pan-tilt heads, as well as sliders and skater dollies. Glide Sliders are available in three sizes, supporting anything from a small DSLR to a full broadcast camera rig. The unique bearing design ensures a smooth move every time, and removable high-hats allow for fast setups and efficient re-configuring of dolly systems. Skater Dollies come in full kits with Mitchell, 100mm, and 75mm bowl adapters, and stand mounts for the track ends. The Skater systems interface with standard speed rail for custom runs of track as long as the shot requires – MYT’s internal splicer keeps the pipes together with no disruption to the camera’s smooth movement. MYT highlighted a new use of their dolly system, with a camera test pattern system rigged to the ceiling of their booth, which could be positioned anywhere down the track for camera calibration at different focal lengths. Matthews Studio Equipment brings several updates to classic product lines as well as new equipment to their growing catalog of grip gear. 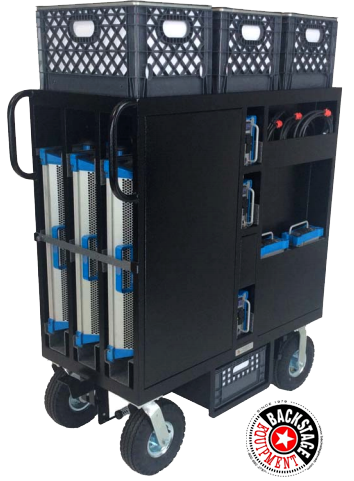 An update to the K-Stacker, the K-Stacker II allows for (3) Kino Flo Select 31 fixtures to be mounted vertically on one position, or (2) classic 4-bank Select fixtures. The unit features junior pins at the base and out the side, for horizontal or vertical rigging, and a baby pin on the top for grip heads and other accessories. Also updated was the Dutti line with the Dutti Dock, which is a camera sled that, when paired with a quick release plate, allows for convenient camera support on any medium-duty light stand. New products from Matthews included the MQ mount, a rugged T12 clamp that is designed to be a tight fit without the possibility of over-tightening and damaging the fixture. Also new is the panel stand, a crank-driven light stand with a combo mount and a low base, specifically designed to support long 120-profile fixtures in a vertical orientation without their running into the legs of the stand. Under new domestic ownership, K5600 has completely revamped their flagship Joker line with the Joker2. The new fixture is available in 400w, 800w, and 1600w versions, and features a redesigned yoke and brake system, new twist-off lamp housing, and a revamped dimmer system, which allows for both wireless DMX through Lumen Radio and local control through an onboard dimmer. The burner assembly on the back of the fixture has also been redesigned to be removable for ease of service – when a unit goes down, the end user no longer needs to send the entire head in for repair. This module also makes it possible to bypass the ballast entirely and put a quartz tungsten globe into the lamp base, for 3200K-based shooting. The Joker2 system is shipping now. Dim – Cineo’s Photo-Accurate Dimming™ maps the 0-100% dimming curve to actual camera stops for precise output control using the MASTER control locally or on the first DMX channel. CCT – For color-accurate white light, choose the CCT as you would with any Cineo fixture using the CCT rotary control or the second DMX channel. Saturation – controls the amount of saturated color to be added to the white light, from full white to fully saturated color, managed on the third DMX channel. Hue – To optionally add saturated color, the HUE control adjusts the hue, the color of which is displayed on the control panel, or managed on the fourth DMX channel. With the Standard 410, the same color shading can be achieved regardless of the CCT used for photography. For example, +2 Green added to 3200K CCT will look the same as +2 Green at 5600K to the correctly white-balanced camera. 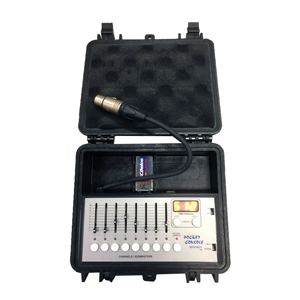 BCI announces THE BEST BOY 2 POCKET CONSOLE®-DMX. The popular Best Boy Pocket Console®-DMX just got better with the emergence of the improved Best Boy 2. The Best Boy 2 is a vastly improved and armored version of the ubiquitous POCKET CONSOLE®-DMX. This new Best Boy 2 Pocket Console comes built into a “Mil-Spec” water resistant case that is superior in all aspects to the prior style case; it is smaller and lighter; comes with a DMX umbilical as opposed to a flush-mount data port, no longer requiring a DMX jumper; has a much smaller power supply; comes with Playback-8 Software. It can be patched just as always with up to 512 DMX addresses, while still recording up to 8 discrete “Submasters” of the 8 Channels. Whether for LEDs, discrete control of 12/24 dimmer packs or for setting or tech-ing a moving light, The NEW Best Boy 2 is ready to take on the job. Fiilex introduces another addition to their product line: The New Fiilex Q8 Travel. 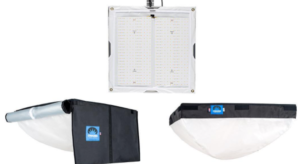 It is the first in the series to come with a customized 8-inch Fresnel lens designed specifically for the proprietary 300W DiCon Dense Matrix LED. 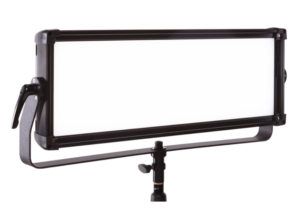 This innovative product offers one of the longest Fresnel zoom range in the industry: 12° – 60°. What is notable is not just the range of the zoom, but also the quality of the light throughout the zoom range. The Fiilex Q8 Travel can flood any wide space with an even spread of light, or focus into a spot with a well-defined edge and uniform beam profile near the center. There is no hot spot at all! The Fiilex Q8 Travel addresses three major lighting needs of every film/video production. First, it produces high-quality light with the ability to smoothly blend with ambient lighting or precisely match lights from other fixtures. Second, it has a solid construction. The robust housing ensures the fixture can withstand harsh transportation conditions and rough handling during rigging. The third is the easy-to-use interface. The LCD display and manual control knobs are sleek, intuitive, and responsive. They allow for accurate adjustments and will help filmmakers establish faster and more efficient workflows on set. The Fiilex Q8 Travel is DC powered. It works with included AC/DC adapter or can connect too many qualified 48VDC batteries. 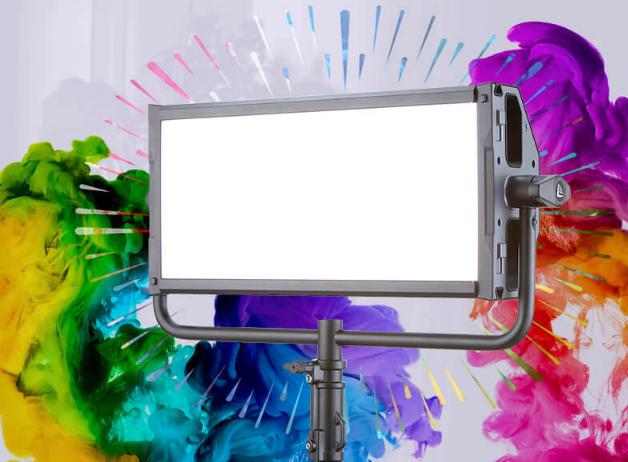 With all the features mentioned above and a weight of only 16 pounds, The Fiilex Q8 Travel is a good LED lighting fixture for on-location use. Rosco had some new things to unveil at NAB this year. First, there was the Rosco Silk 205 and 305 LED soft light provides uncompromising light output for film and broadcast professionals. Designed to meet the requirements of the most discerning filmmaker, the Silk 205 LED light fixture has been specifically developed for film and video applications that demand extremely color-accurate, high-quality light. Utilizing proprietary, state-of-the-art, tungsten & daylight balanced LEDs, Silk 205 and 305 LED fixtures to produce a high volume of broad-spectrum white light. With TLCI, CRI and R9 metrics in the high 90’s, the fixture is capable of producing a high volume of light output at color temperatures ranging from 2800K – 6500K. Next there was the Best Of Show Award from DigitalVideomag. the MIX from Rosco and their new acquisition DMG Lumière. MIX features 6-LED color mixing: Red + Lime + Green + Blue + Amber + White. This enables it to generate a wider gamut of colors than RGBW or RGBA fixtures. In addition, the Red and Lime emitters in the array are manufactured exclusively for MIX – meaning that it can create colors, tones, and hues that are only available from a MIX light. 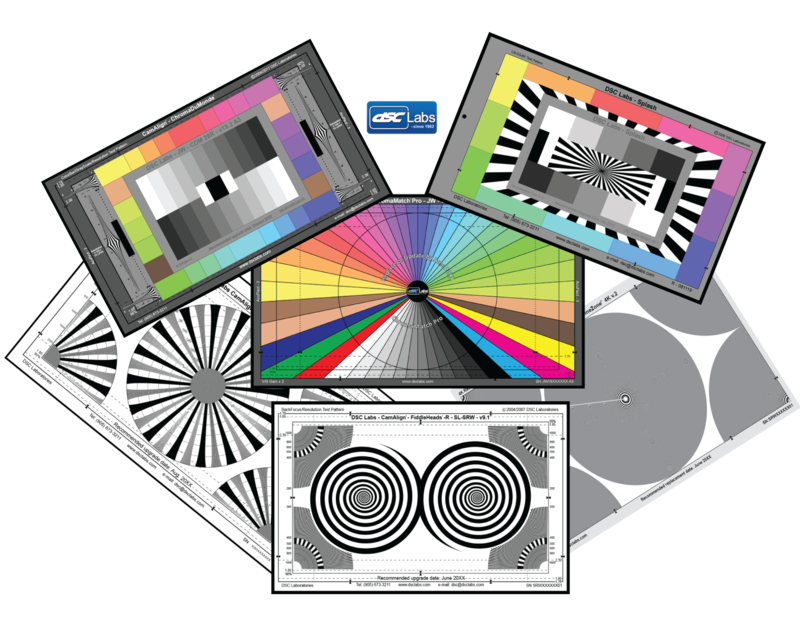 Every Rosco gel color in the MIX library has been authenticated by Rosco’s color experts as a match on tungsten and daylight sources – by eye, by meter, and by camera. In addition, the MIX control software also allows you to set the base color temperature of the light before adding color. The MIX has no menus. Simply choose between three different modes (Gel, White and Color Mode) then choose the color temperature, color or Rosco gel color you desire from there. Rosco DMG also showed their new myMIX App. It will allow filmmakers to easily control their MIX LED fixtures from their mobile device – and so much more! Whether you’re mixing your own colors from scratch, or modifying a Rosco gel color you’ve chosen – you can mix the color you need using the myMIX App. From there, you can save those colors into your own personal library of colors in the cloud to call up whenever you need them in the future. The myMIX App allows you to capture a color and then send it to your MIX LED lights. If the color isn’t quite right – no worries. Just like any other MIX color, you can adjust the hue, intensity, and saturation of your captured color until it’s exactly what you need – then save it to your library. Introducing MIX from Rosco and DMG Lumière. MIX features 6-LED color mixing: Red + Lime + Green + Blue + Amber + White. This enables it to generate a wider gamut of colors than RGBW or RGBA fixtures. In addition, the Red and Lime emitters in the array are manufactured exclusively for MIX – meaning that it can create colors, tones, and hues that are only available from a MIX light. Every Rosco gel color in the MIX library has been authenticated by Rosco’s color experts as a match on tungsten and daylight sources – by eye, by meter, and by camera. In addition, the MIX control software also allows you to set the base color temperature of the light before adding color. Amazing color control and preset setting will also be coming soon via the new myMIX App. The Manfrotto Pro Light Cinematic Expand video backpack is a professional videographer’s bag designed for a one-man-band & run and gunner who needs to carry everything required to do their job in a single bag. This carry-on* pack is built to hold and protect a modular camcorder with up to 70-200/2.8 mm lens attached and up to 10 lenses, video accessories or camera bodies. Manfrotto’s signature Camera Protection System dividers ensure optimal protection from the heart of the bag. An independent, checkpoint-friendly laptop pocket holds a device up to 17”. Thanks to its expandable front, this pack can be made bigger to fit a camcorder with its handle assembled. With a simple gesture, the bag can be expanded and its configuration changed to a handy working mode. When the backpack needs to be as compact as possible for travel, the front panel can easily be made smaller to fit carry-on travel bag size criteria. The new Flexi Shock Absorbing System helps place different cameras in the right position to provide space for the expandable handle while cushioning the contents for optimal camera body protection. The bag also features quick access to the internal zippered pocket from the side, so that you can change lenses without losing a moment. The front and side Never-Lose strap secure your video gear’s perfect support to your bag. The load lifters, sternum straps, shoulder straps and waist belt are fully adjustable for the most comfortable, customized fit. Made of water-repellent Rip-Stop nylon/polyester, hollowed ITW Nexus buckles and Duraflex hardware, the pack is ultra-lightweight yet strong enough to safeguard a large amount of gear for the long haul. It also features external zip or stretch pockets for accessories and a water bottle. The backpack comes with a DuoFace sun/rain cover to protect from harsh weather and reflect sunlight to keep gear cool and dry all day long. 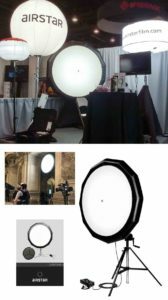 Ikan was showing their new Oryon 14” and 18” Bi-Color 3200K-5600K Ring Light w/ 15mm Rail Adaptor, Light Stand, and batteries. 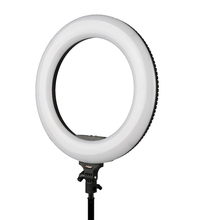 This new multi-mount ring light is available in 14” and 18” and has just the right amount of illumination to give any subject that sparkle in their eyes. The large diameter opening allows for any size camera to be used with the light. The soft diffused LED’s give the ring light a bright but wrapping light that makes your subjects glow. The control knobs on the back of the allow you to quickly switch from brightness to color with a simple push of the button. The custom 15mm camera mount system allows the professional to adjust the camera to any height. The heavy-duty compact stand folds up tightly and makes it easy to carry. The lights come in Bi-Color (3200K-5600K adjustable) with a 96 CRI and a 97 TLCI. Also with two Sony L batteries and Dual charger included this light give you up to 4 hours of uninterrupted light. DeSisti showed their new SoftLED 2 XL which has replaced the remote phosphor technology used in the SoftLEDs with Fixed White chips. These new chips are adding 50% more light output than their predecessors while retaining CRIs greater than 96 and TLCIs of 97.5. I was told that Lighting Designers had requested DeSisti to add a longer fixture with a larger surface area. It’s nice to know they listened and acting on those suggestions. The SoftLED 2 XL uses the same power as the SoftLED 4 but is 20% brighter. On another note, the Piccoletto joins the DeSisti line of Variable White Fresnels (2700K – 6500K). This is their 300W tungsten equivalent. At this year’s NAB, Coemar debuted their new 6-color LEDko FS6 LED light engine and it is a winner. The new LED chip on board includes Red, Green, Blue, White (5600K), and now Lime & Phosphor Corrected Amber. Their goal was to create an all-in-one fixture that could address both Studio and Theatrical markets with the capability of producing intensely saturated colors without sacrificing the output punch of the whites. The purpose behind adding the Lime and PC Amber is to help “beef up” the Red, Green and Yellow parts of the color spectrum as well as adding the ability to produce a high CRI (above 94) throughout the range of whites. Depending on the mode you select, the new LEDko FS6 can be used as a variable white (2700K – 6500K) or an all-in-one, color changing fixture. All LEDkos can be controlled via DMX, RDM or locally at the head. 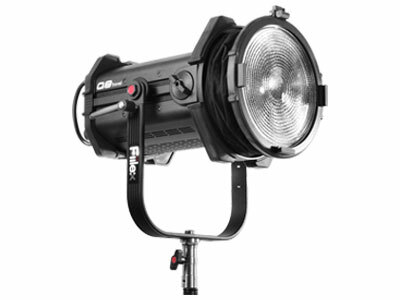 Also new to the Coemar product line are an LED Spot and Fresnel moving heads. The LEDko TM F6 uses the same 6-color LED light engine as in the LEDko FS6 in addition to all the characteristics you would expect in an intelligent profile fixture: Zoom (13-38 degrees), Internal Framing Shutters, Iris, Frost Filter, and Pan/ Tilt. For the Fresnel crowd, the LEDko TM Fresnel is available in either Tunable Tungsten (2700K – 4100K) or Tunable Daylight (4100K – 6500K), both of which include RGBW LED chips, Green/Magenta manipulation, Proportional Zoom (13-65 degrees), an Internal Barndoor Framing System, and Pan/Tilt. These will be available for sale shortly. BB&S Lighting of Denmark showcased it’s Force 7 this year at NAB. The new single source LED technology provides a CRI of 97 with an output that is equivalent to 750 watts. They are also accomplishing this while only drawing 180 watts from an externally mounted 48-volt power supply. The dimming is very smooth from 100%-0% with no hot spots or double shadows while using gobos or effects. 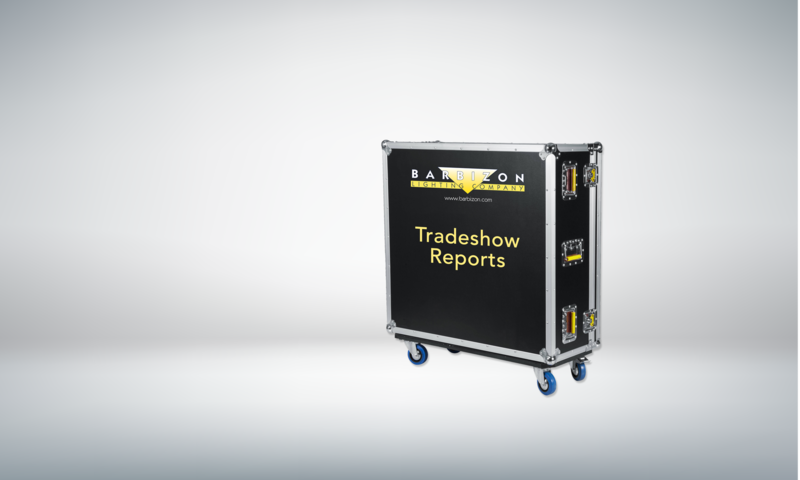 The demo that was set up at NAB confirmed the manufacturer’s claims! The edge to edge light is very clean. The fan is also extremely quiet which makes it a great option for studio use. The Force 7 is compatible with all ETC Source 4 barrels and lenses and is available in custom colors and comes with a Powercon True-1 AC Power Cable. Photon Beard is committed to keeping things simple and the Highlight LED does just that. They have taken their best remote phosphor technology and unique optical approach to providing a punchy full spectrum LED luminaire that has an excellent Color temperature and output rating that is guaranteed for 5 years. Adding a cyc hood to these fixtures makes them an excellent choice for lighting your green screen. The fixtures can be operated locally or through DMX and this year they have added a USB port to the rear of the fixture, so firmware updates are simple as well. The fixtures can dim from 100%-5% while maintaining a constant color temp. Cooling is passive so there is no issue with fan noise.